I carved out some time yesterday to sit down and make something from my sketchbook. In fact, I made more than one design from it! Here's all that I got accomplished yesterday. 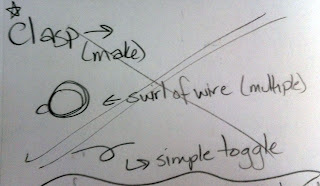 While thinking about it, I noticed a scrap piece of patina-ed copper wire sitting on the edge of my craft desk. I grabbed it up and set to bending, twisting, and hammering. 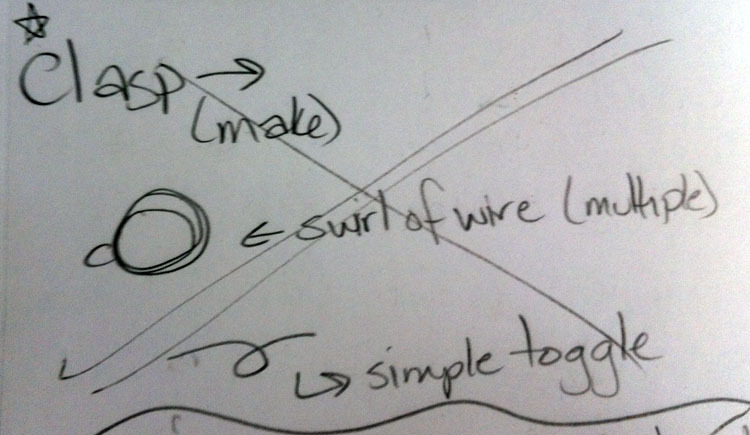 Before long, I ended up with the two sets of toggle clasps in the above photo. I apologize for not having a closer picture of them, but wasn't having much success with picture-taking today. Once that was done, I was still itching to get something made. The next sketchbook entry looked like this. I decided against the embroidery thread when I found a little stash of some colorful silk ribbon. It's a fairly simple bracelet, but looks very teen/tween to me. 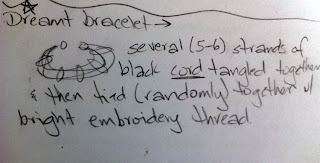 Once the bracelet was made, there were a few scraps of the black cord on my desk. I couldn't let them go to waste so they quickly became earrings. While it wasn't much, I was really happy with my use of 'leftovers' and scraps. Check out what else is going on this Bead Table Wednesday in the Flickr Group. 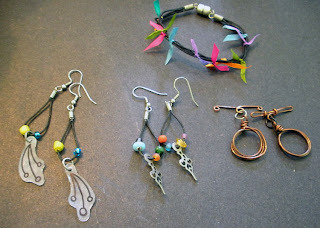 I also added a new pair of earrings and placed a necklace on sale in the CraftyHope Etsy Shop. Now to get back to some of those million things! What have you got going on today? Hope, I like what you did with your scraps. I like the idea of using clock hands on the one pair of earring, so cool! Very cool beans! That bracelet is adorable. I wish I had dreams about jewelry! 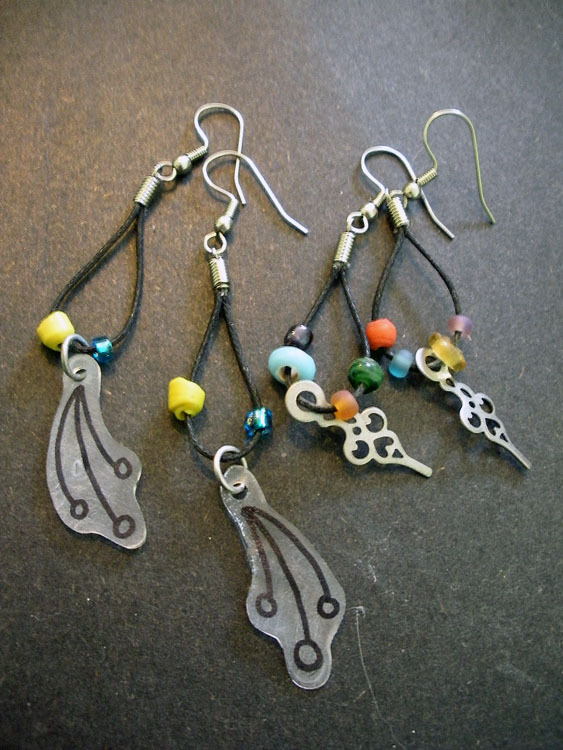 I also love the earrings that look like they have clock arms on the bottom. Good stuff! I esp. 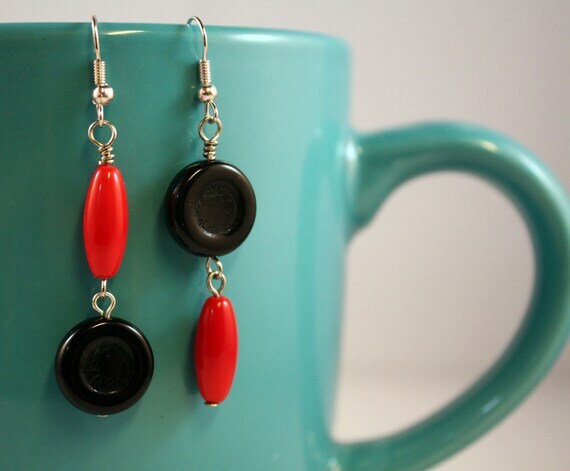 like your clasp and the fun earrings suspended from the coffee mug! Congrats on getting so much done today! What a nice clasp! 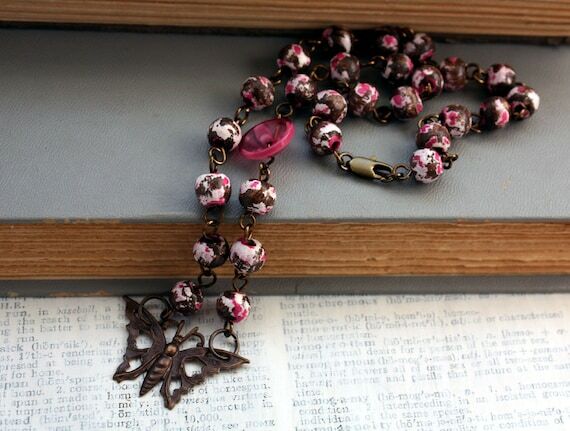 Trying to make a clasp is on my To-Do-List. We'll se when I'll cross it out. 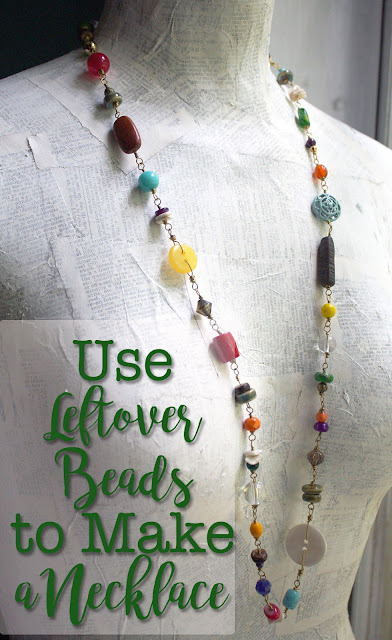 I love what you did with the scraps! The earring with the clock hands are so cool! 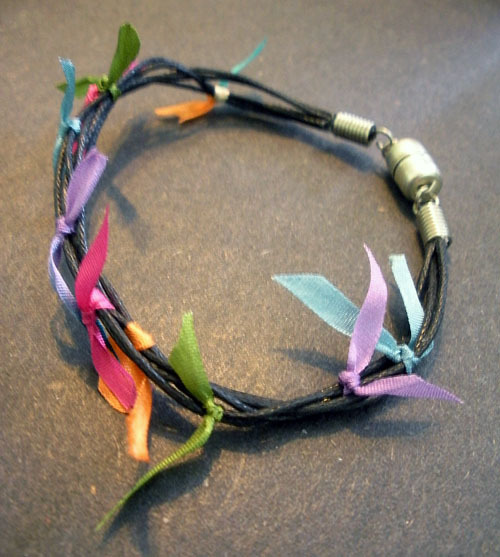 And, I love the bracelet. It reminds me of spring! Linda- I'm sorry I didn't post earlier then. But I have been busy! I'm so glad you like those items. I didn't really get as much done as I had hoped because an allergy attack started draining my energy. Oh well. Ambra- Yay! I'm pleased that you like the clasps too!! Best of luck as you work on your own. 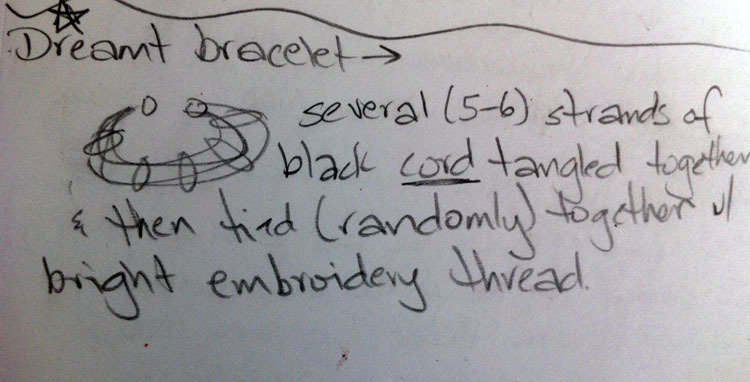 I'll admit that the sketch of the clasp has been in my sketchbook for WEEKS-MONTHS now. That's part of why I write everything down. . .so I can get to it one day. 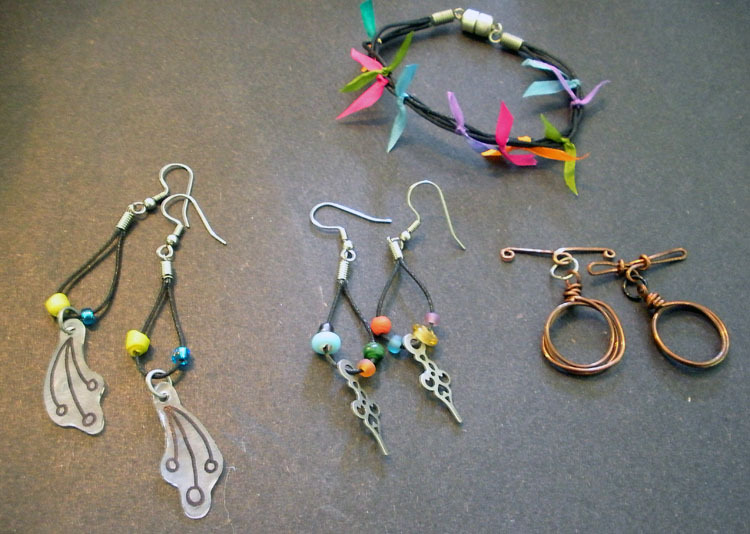 Fun and funky earrings! 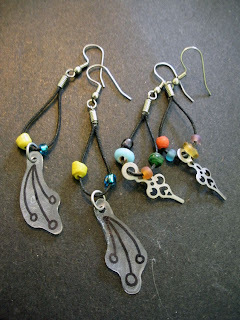 And I really like the opposing earrings! Wow, such creativity. I would never have thought of those things. They are beautiful! I hope you enjoyed doing that.